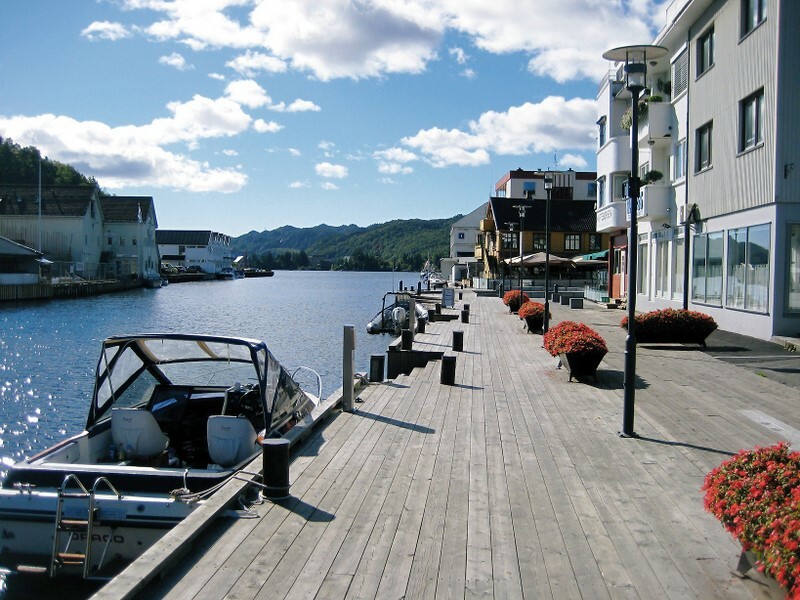 Our plan for this day was to have an easy start by looking around Åna-Sira and enjoying the setting of the Seldal summer place with its history as a Norwegian fisherman's home. 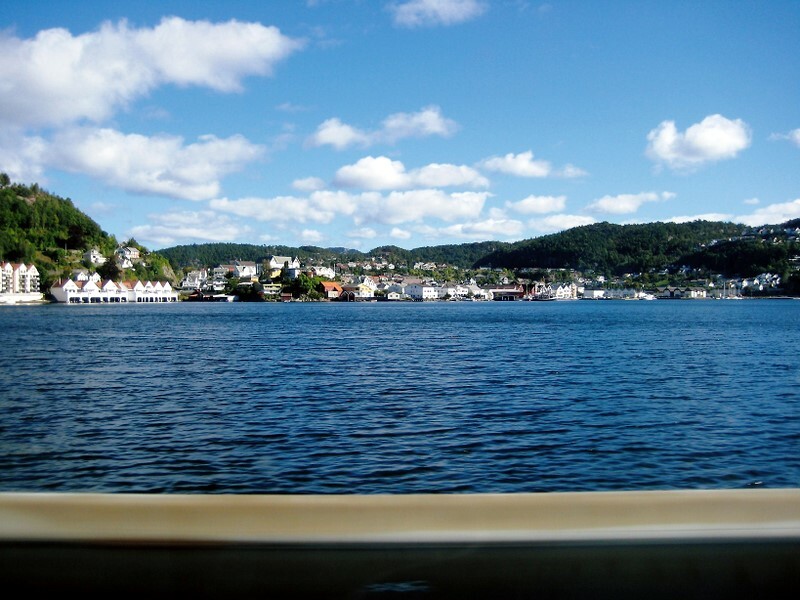 We would then drive across the river into Vest-Agder and east to the city of Flekkefjord. 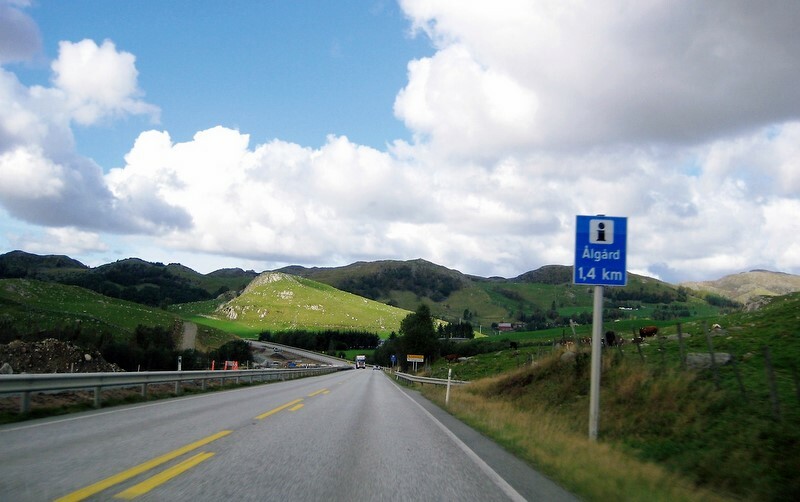 Next our return route north would be on the faster main inland highway toward Stavanger. We would stop briefly at the Bjerkreim parish church. This would be a long day's drive but might get us north of Stavanger to the island of Finnøy in time for Gunleif to attend a board meeting. There at a wooden boat building and repair facility, the project of building a full-size sailing replica of the historic emigrant ship, the sloop Restauration, is in its early stages. This would also give Peg and Keith an opportunity to meet the other board members working toward this worthy and fascinating project. The weather would hold cool, but fair. However, on this crucial day, the memory card for our new camera would fail totally. Thanks to a very competent photography technician at Klepp Foto, many photos from this day were "rescued" from the defective card. 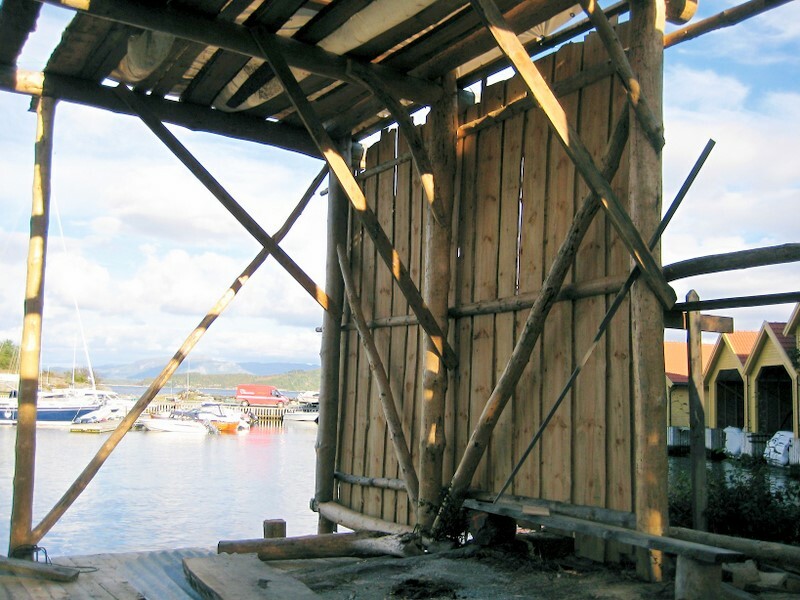 Sadly, quite a few photos could not be saved - this being especially frustrating as over 2 dozen photos taken at the Finnøy boat building facility were among those lost to digital Never-Never-land. Keith & Peg were up early to watch the sunrise strike the tops of the surrounding stone mountains. 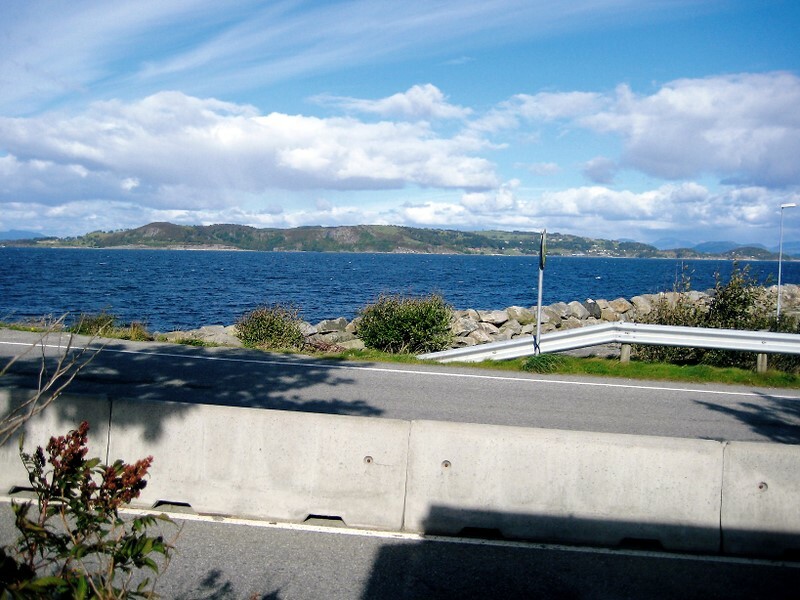 This is the view from beside the Seldal house looking out toward where the river meets the North Sea. 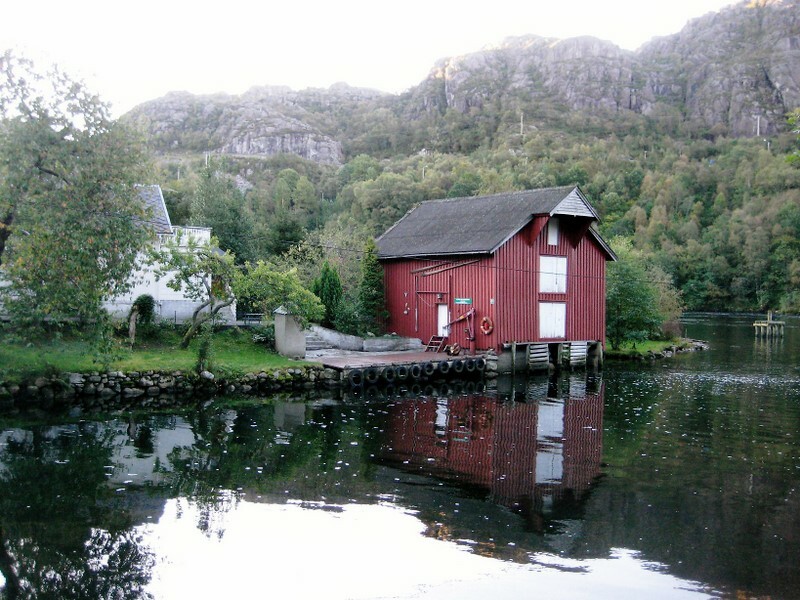 On a calm morning, this is the view from across the backwater of the Seldal "summer home" & adjacent fisherman's building. 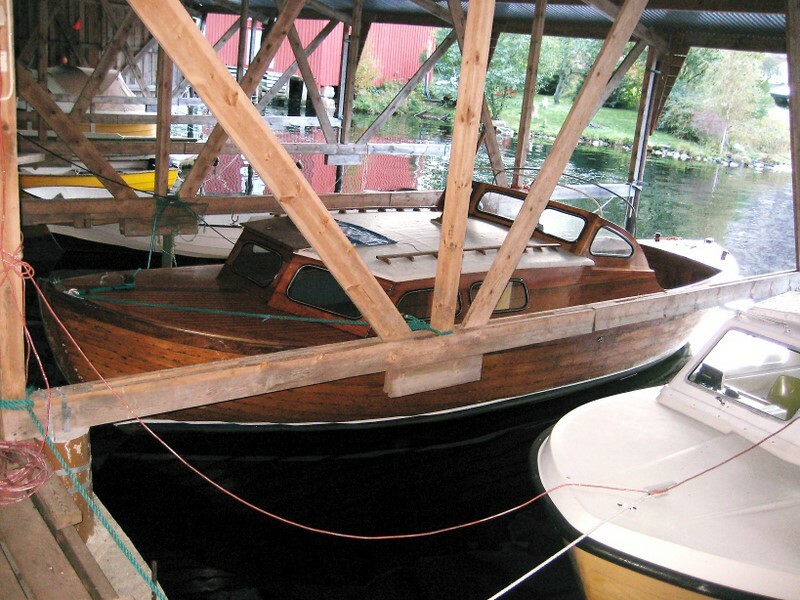 Walking on to the community boathouse we find Gunleif's antique wooden motor boat. 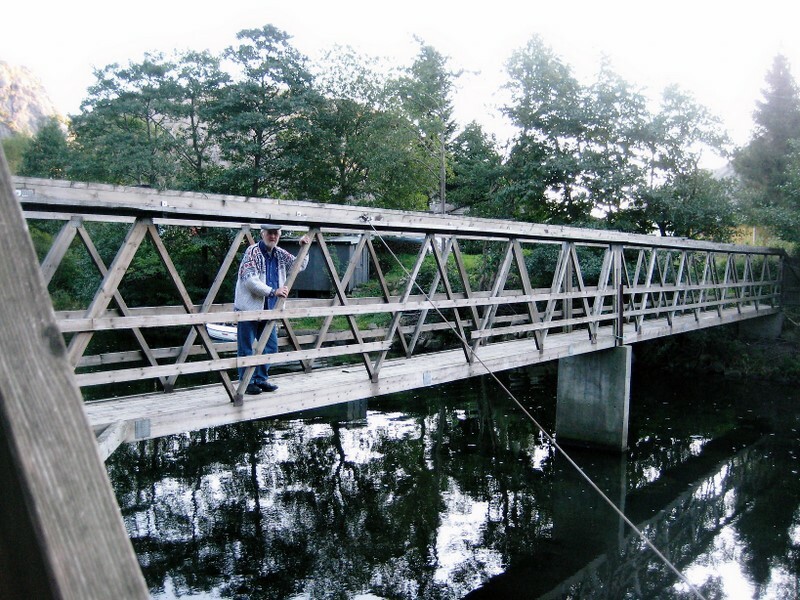 Coming from the boathouse, Peg pauses on the footbridge approach to soak in the beauty of this fall setting. 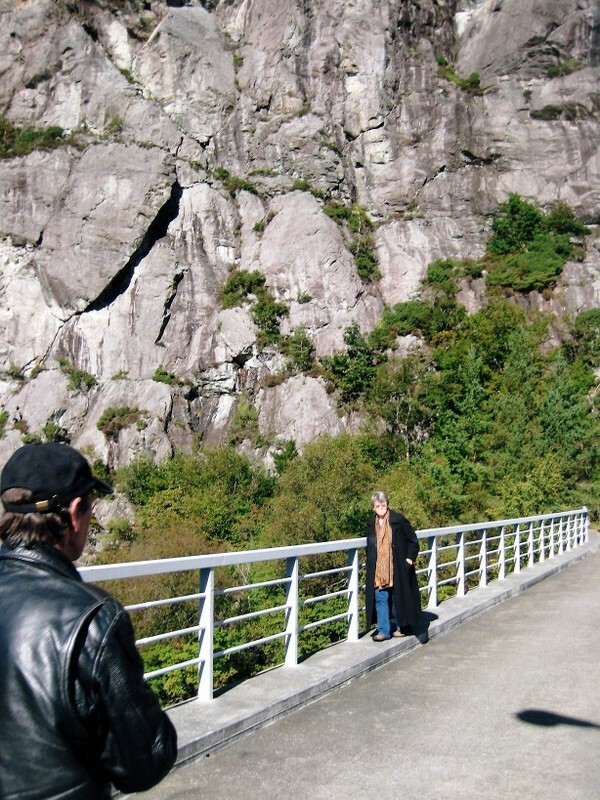 Peg catches Keith farther out on the footbridge as he enjoys the fantastic scenic views. 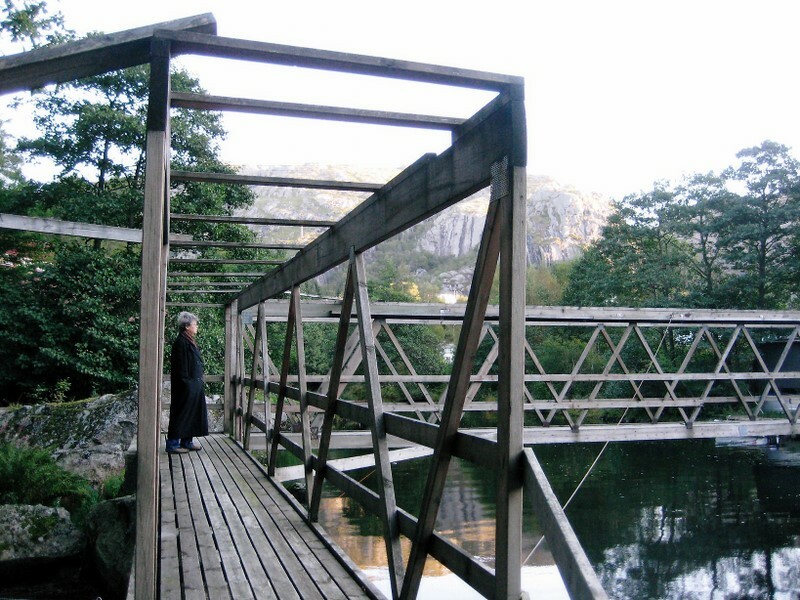 This is the footbridge view of the old fisherman's house and storage building, once an active site for the Log family engaged in the fishing business. 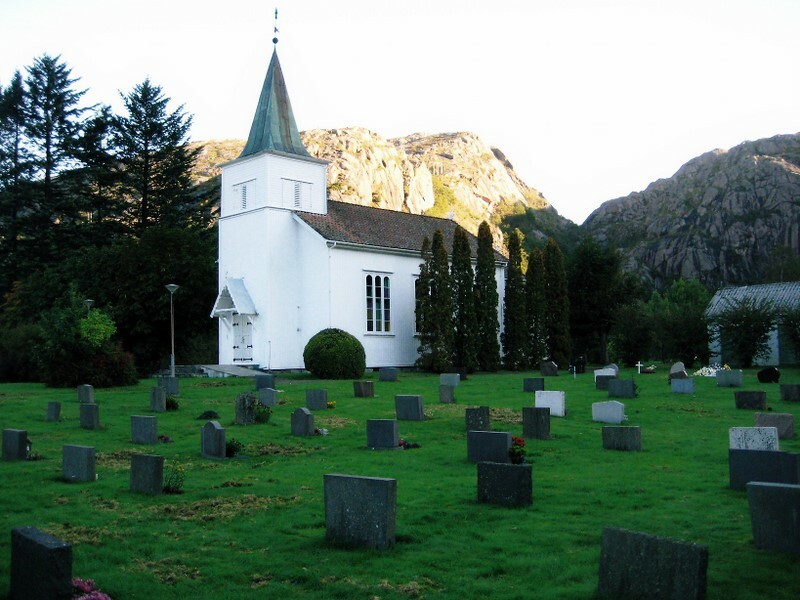 We walked the short distance to the Åna-Sira parish church & wandered among the grave stones. 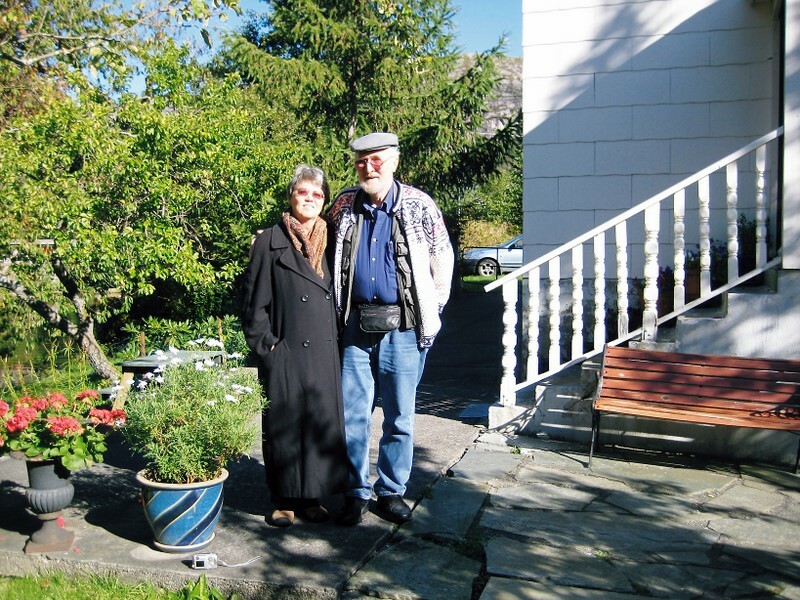 At the entrance of the old house, Gunleif takes this picture of us in the morning sunlight. It would be hard for us to drag ourselves away from this beautiful spot. 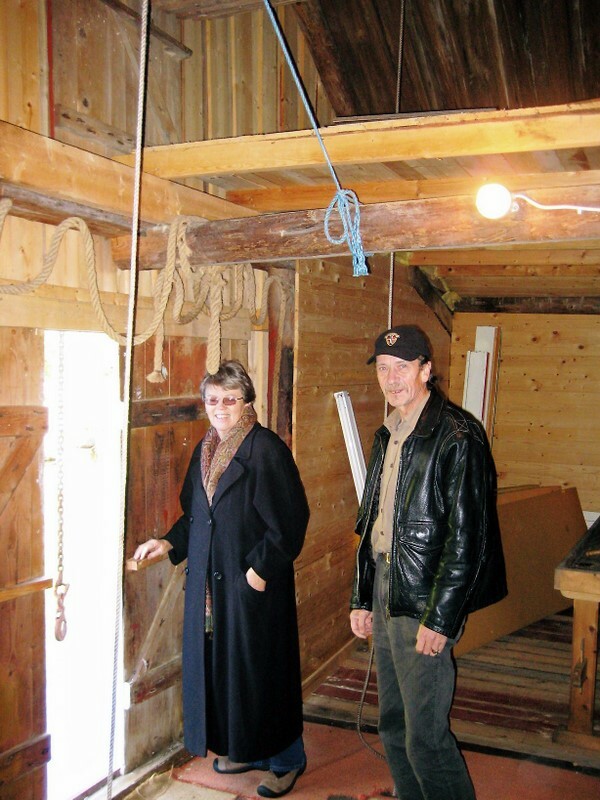 Before we leave, however, Gunleif shows us the interior of his fisherman's building, with this being the upstairs door where the daily catch was hoisted. 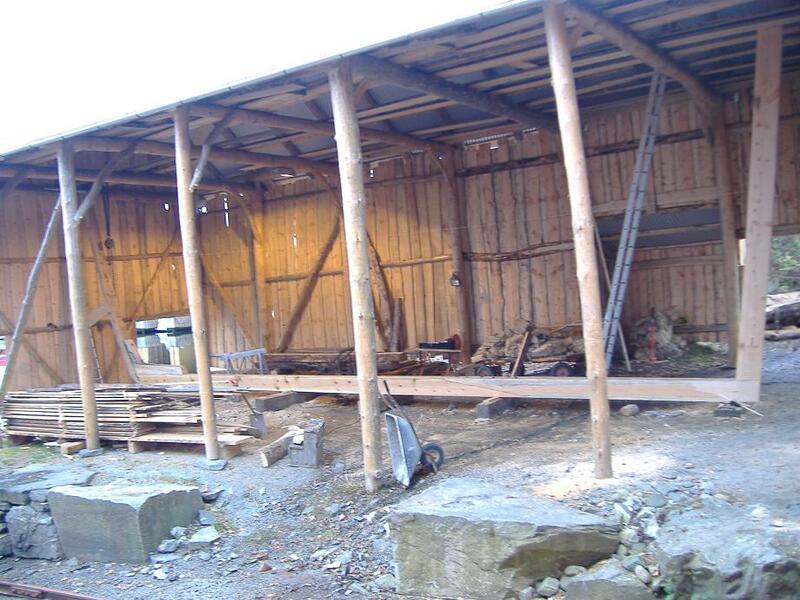 It is now used for storage, a workshop & extra sleeping space for summer guests. Before heading on to Flekkefjord, Gunleif takes us up the river by the Åna-Sira hydroelectric facility where this huge turbine is on display. 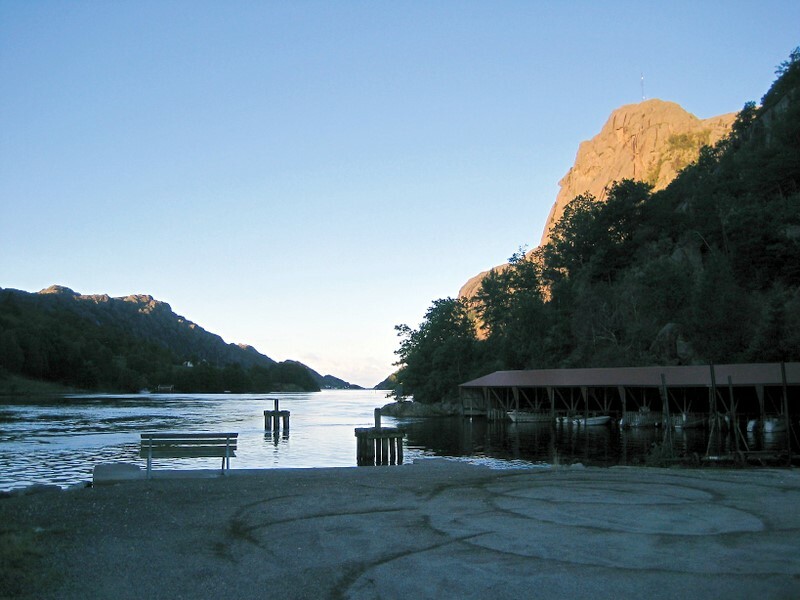 The dam & hydro plant here is the last of a very long & extensive system of dams & plants reaching miles to the north east into the Sirdal region of Vest-Agder & high above the east end of the Lysefjord. Tomorrow we will visit part of the upper end of this vast system. 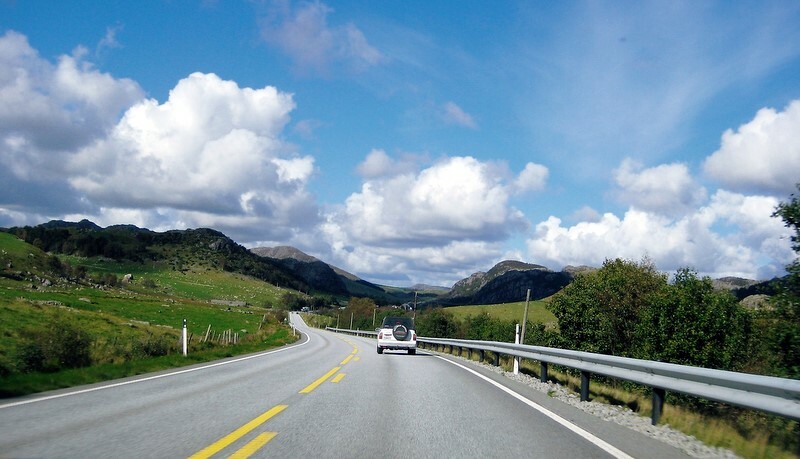 Back on Highway 44 heading eastward into Vest-Agder we see Flekkefjord across the end of Lafjord which leads to the sea. 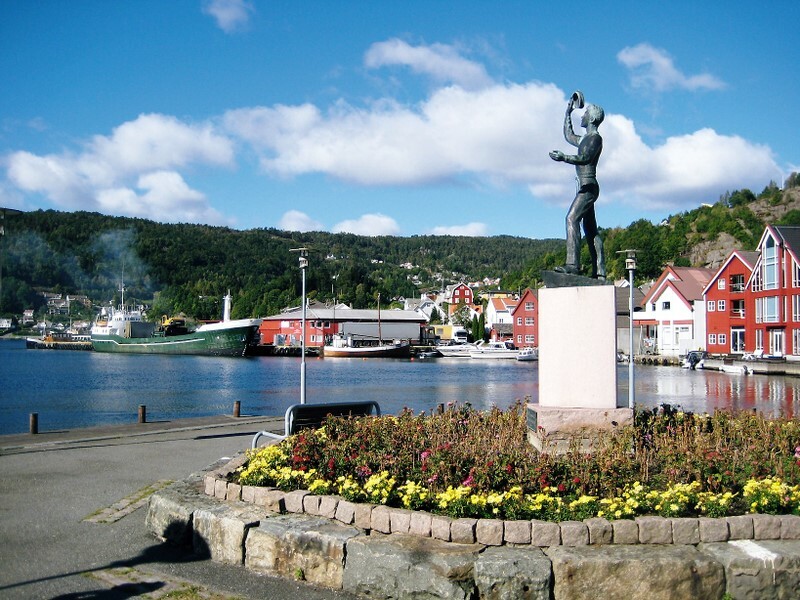 Arriving at the quay in Flekkefjord we get this view of the active waterfront behind this city's prominent statue of Ola the sailor boy. Of course Keith tries to get a decent photo of the church in the center of town. 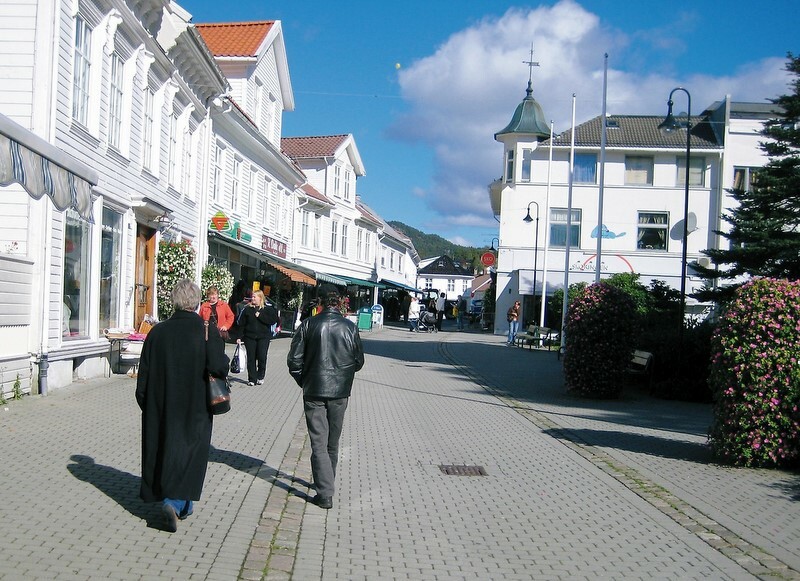 We don't have much time to really get familiar with Flekkefjord, but Gunleif shows us around some of the main streets near the waterfront. 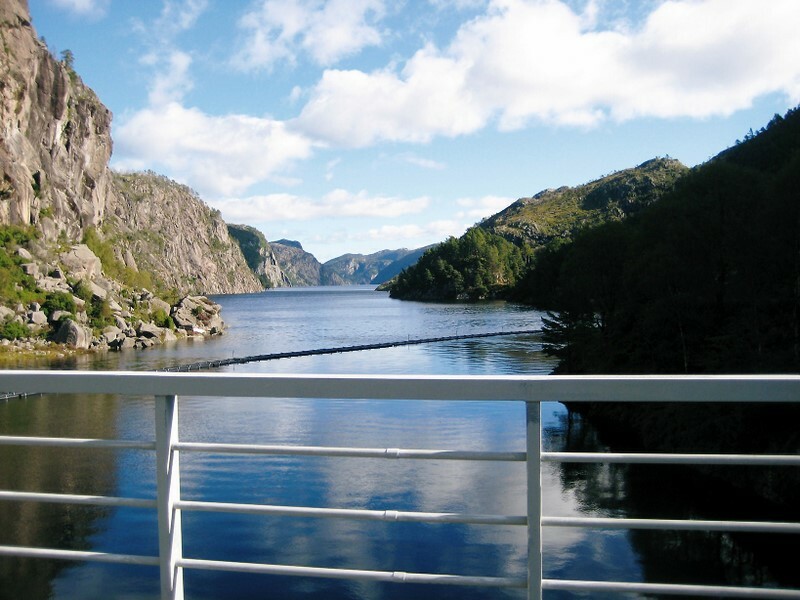 Here we walk along the pleasant waterway that connects the Lafjord to the more inland Grisefjord. 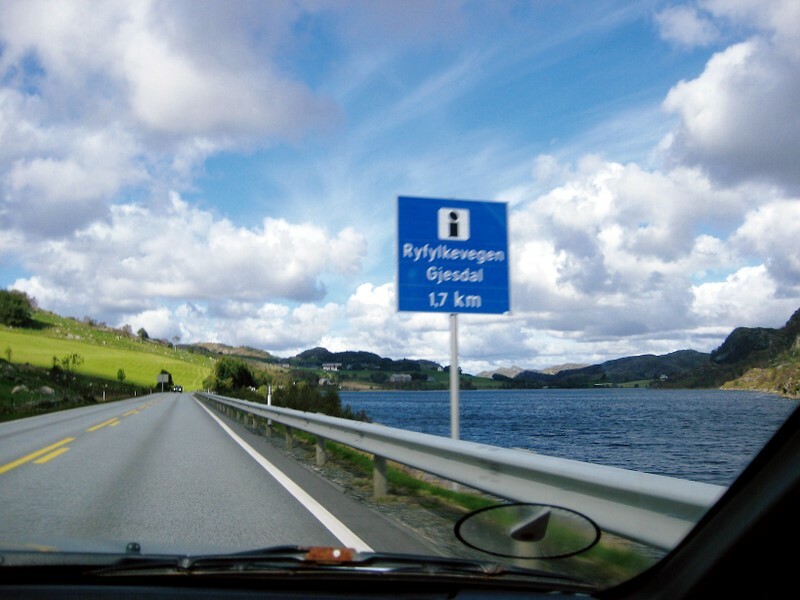 Leaving Vest-Agder we reenter Rogaland fylke & head north on the major highway E39 (old E18). Here we near Bjerkreim kommune. An important stop here is at the Bjerkreim parish church. A few years ago Gunleif uncovered the previously unknown fact that Keith's Slooper great great grandmother, Serena Tormodsdtr Madland was christened here on 1 Jan. 1814. 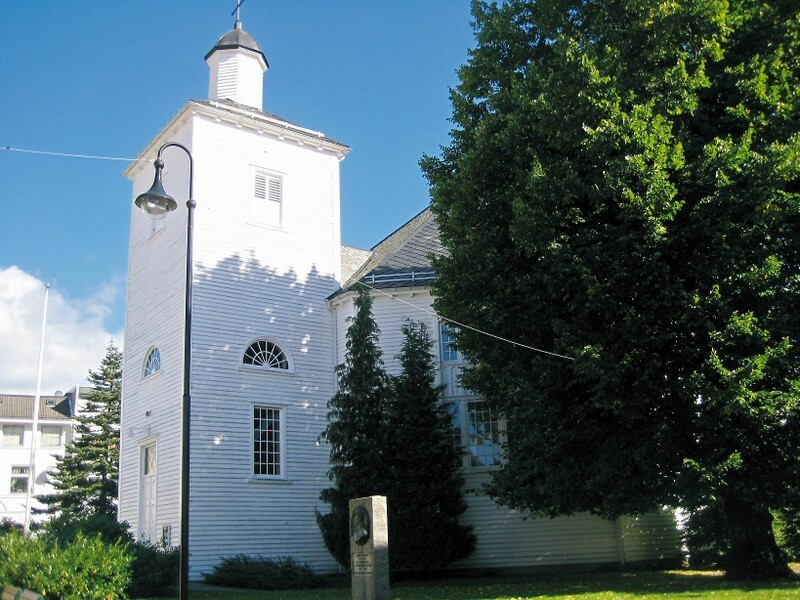 As this decorative metal lighting rod indicates that this church was built in 1835, this was not the actual building in which the baptism took place, but it was apparently on or near this spot. South of Søyland, with Kydlandsvatnet (lake) on our right, we near the border between Bjerkreim kommune & Gjesdal kommune to its north. 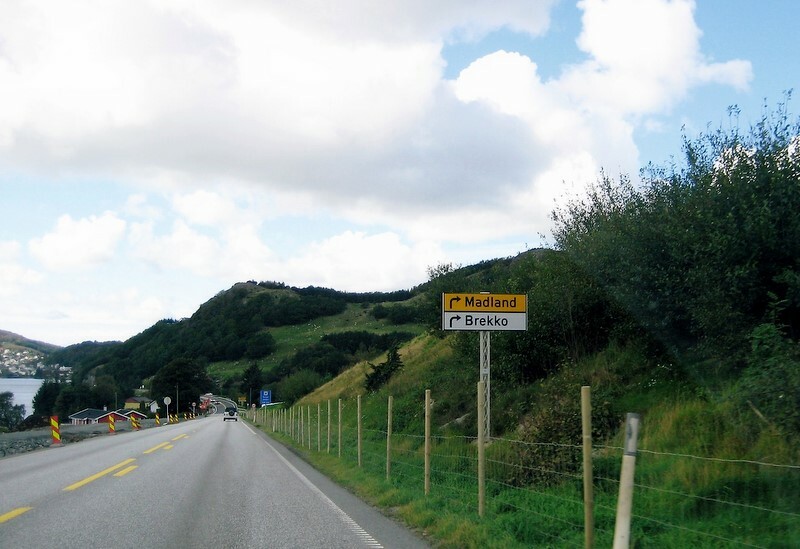 Serena's father was from the Madland farm in Gjesdal & that was the family name they carried around this part of Rogaland & as they settled in Stavanger before emigrating. 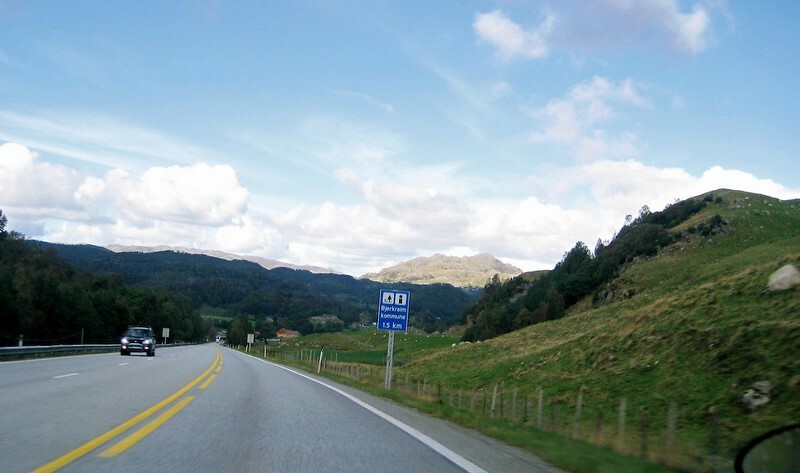 Although the camera card was losing some data at this point, we believe this is a representative view of Highway E39 as it passes through Gjesdal southeast of Ålgard. Here we are 1.4 kilometers southeast of Ålgard but still in a very rural setting. 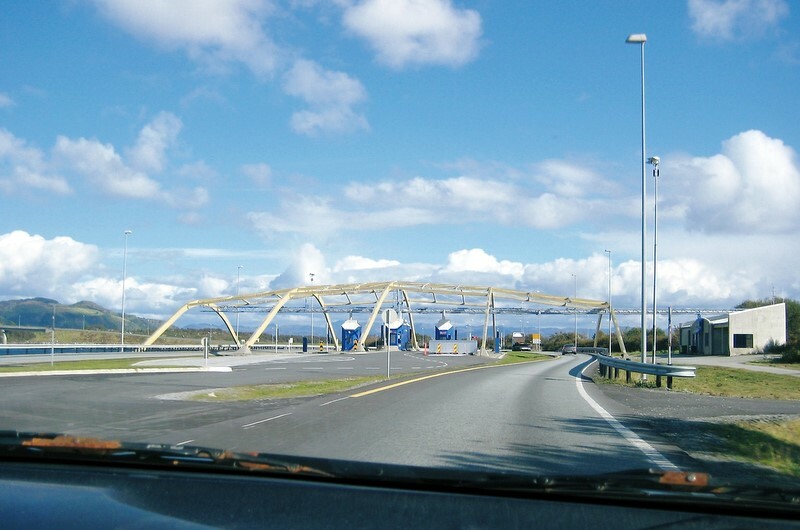 Staying on highways we skirt around Stavanger city & are soon on the islands just to Stavanger's north. 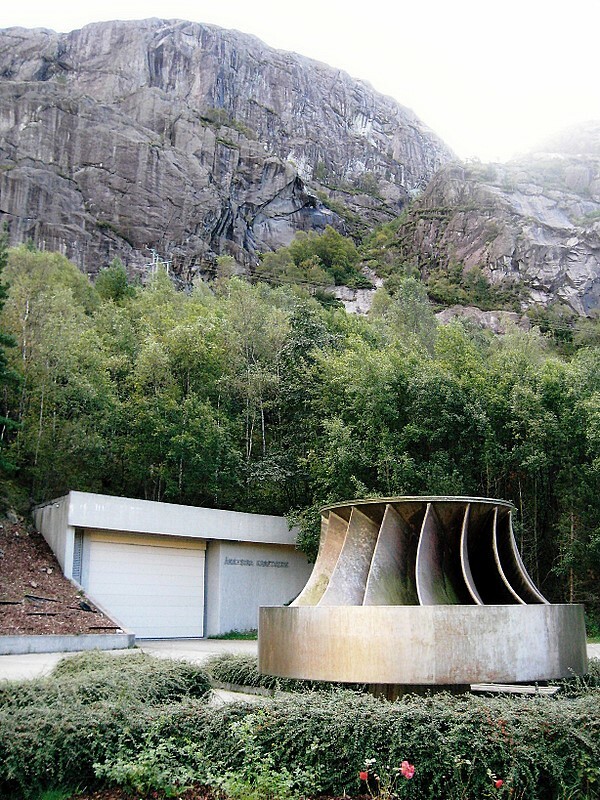 Here is the former toll station used to collect funds for tunneling the highway under parts of the fjord. No longer in operation, we hear quite varied opinions about why the government had decided to keep it for "historical reasons." Waiting for the ferry on the east side of Rennesøy Island we get this view of our destination, Finnøy. We will get to the board meeting place at Judaberg on Finnøy just as the board meeting was ending. Still we get to meet all those attending. It's now late in the day & we are all short of time, so we head next to the boat building facility. Here is where our camera card failed miserably & we are left with only these 3 pictures taken where the replica will be constructed. 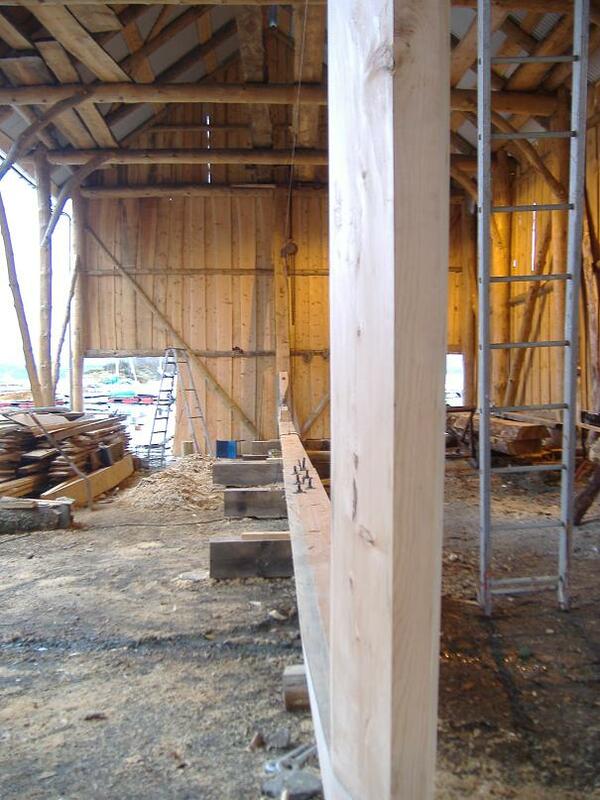 In this photo we are almost standing on the wooden beam that will be used for the Restauration's keel. The view is back toward some of the yard's other buildings. 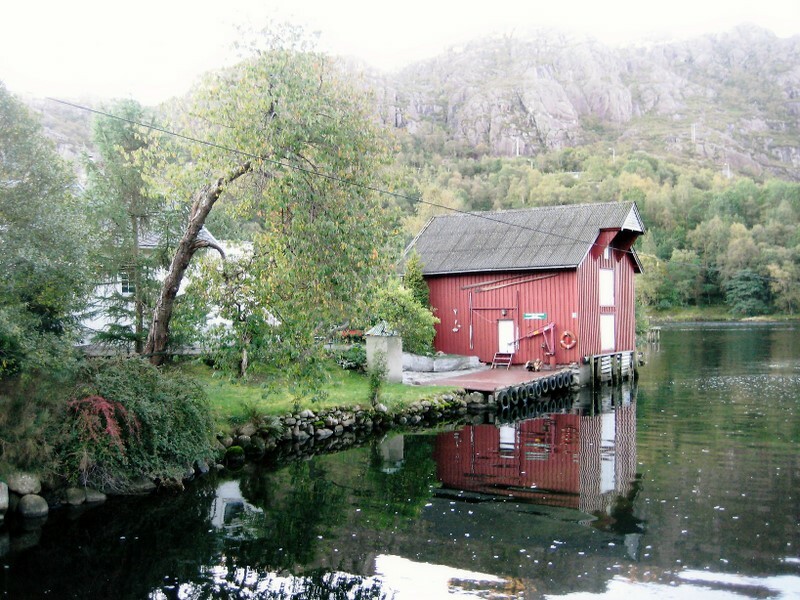 The name of this facility is "Ryfylke Trebåtbyggeri" (wooden boat builders) & is located just south of Judaberg. 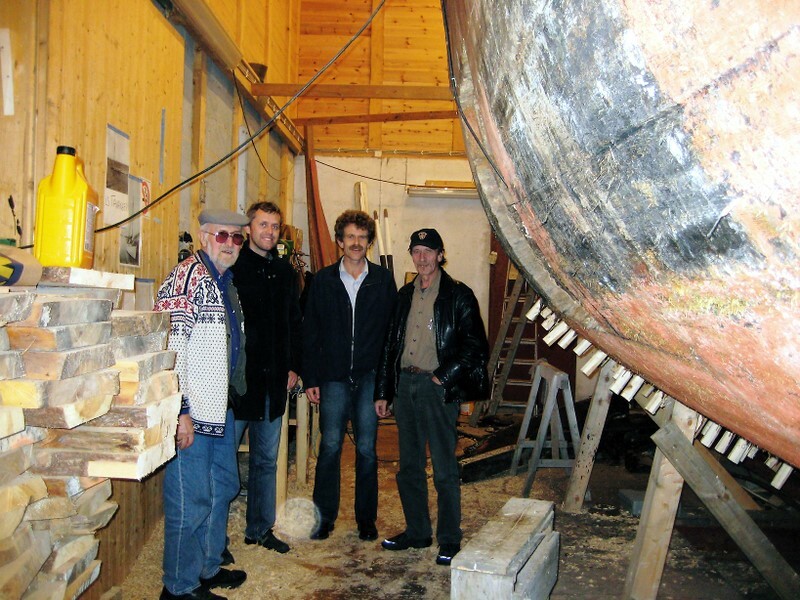 Inside another large building where an old wooden ship is being restored, Keith stands with board members Per Inge Bøe, Arne Nordbø & Gunleif Seldal. Later we hope to add more photos taken of this facility & project. Check back for project updates. Also we hope to update our WheelerFolk.org "Sloop Restoration" web page with links to progress on this project. 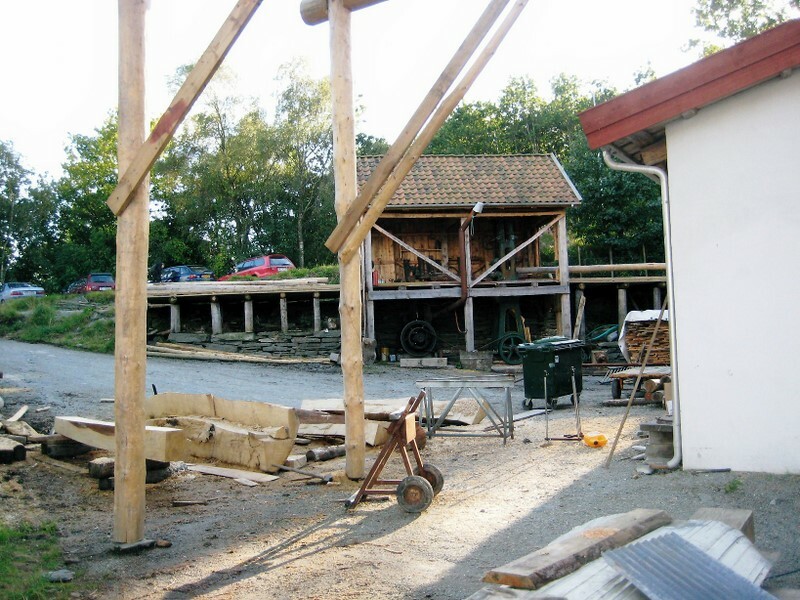 In an e-mail from Board Member Arne Nordbø dated 4 Nov. 2007, the 3 photos below were sent & also include the information that the "boat shed" in which the replica will be built is finished. Two photos show the status of ship construction as of the end of October. While much still lies ahead, the ship's keel is now connected to the bow & stern timbers, giving the outline of the hull. Reisinga - Framework starts to take shape with bow & stern defined by these uprights. Fra stilk mot stavn - From stem to stern. 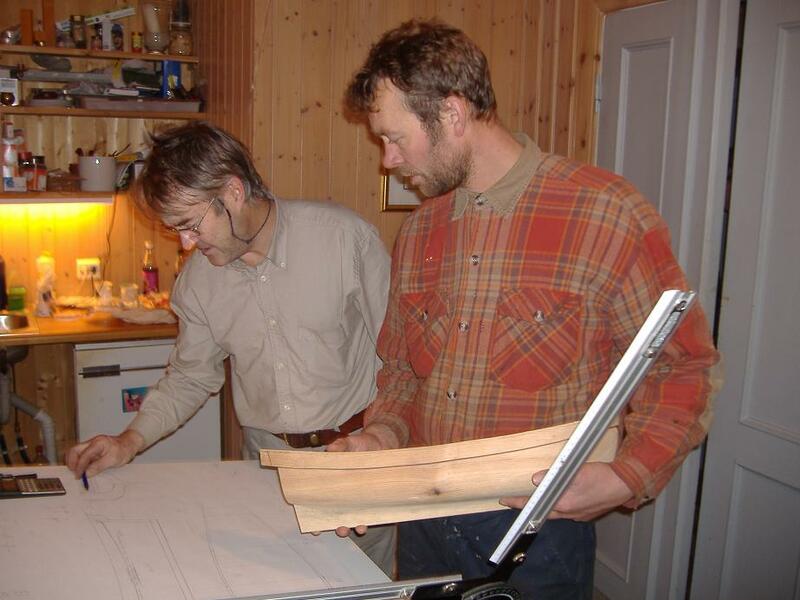 Jørn med halvmodell og Clement teiknar - Board Member/Shipbuilder Jørn Magne Flesjå (right) with half-model & Board Member Maurice Clement (originally from New Zealand) works on technical drawing of the Restauration. 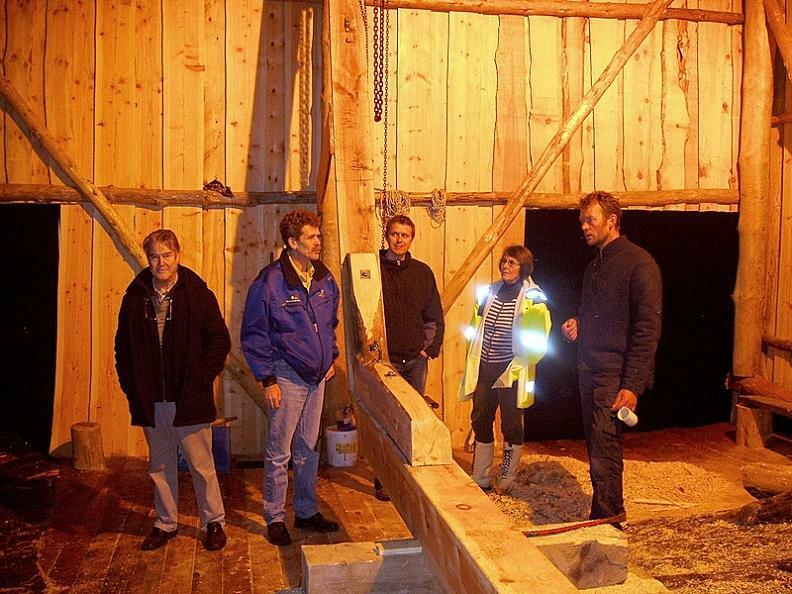 Board Members inspect construction progress of Restauration replica on 1 Nov. '07 - Pictured (L to R): Maurice Eric Clement, Arne Nordbø, Per Inge Bøe, Jorunn Strand Vestbø, & Jørn Magne Flesjå. Not pictured: Gunleif Seldal who took this photo. Keith & Peg next to restoration project of another old Norwegian wooden boat at the Ryfylke Trebåtbyggeri facility on 18 Sep. '07. Photo on right: Chair & desk in this house that was supposedly used by Cleng. 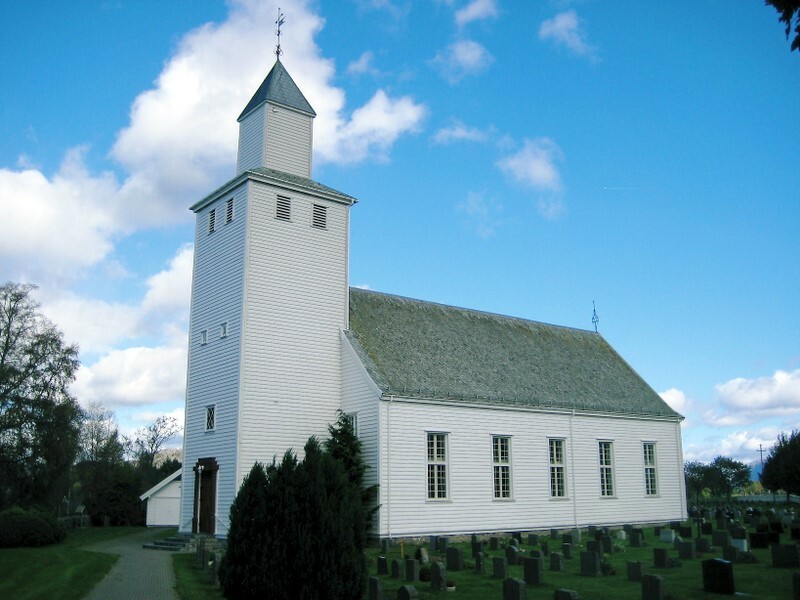 *Cleng Peerson played a prominent historical role in Norwegian emigration, being the "advance scout" traveling to the US to make preparations for those coming in 1825 on the sloop Restauration. 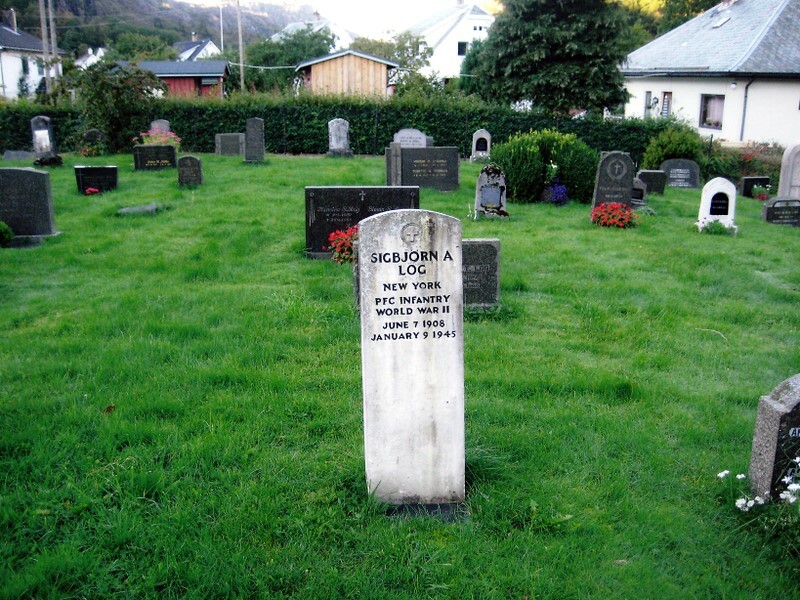 He was born & raised in Tysvær to the north, but lived here on Finnøy before going to the States.